Jana Emmons submitted this photo and caption. 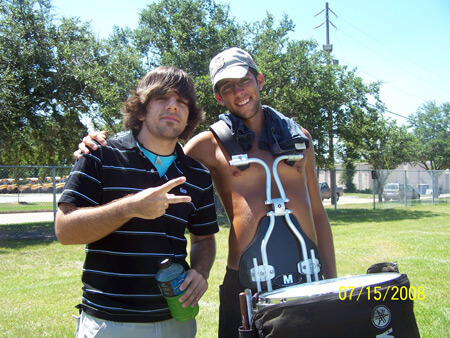 This picture was taken at the Drum Corps International show in Ocean Springs, Miss. Pictured is Chad Webber (L) and Donnie Weichel. Chad and Donnie were members of Spirit's drum line in 2007 and were also seat partners on the bus during the corps' summer tour. Chad "aged out" with Spirit and Donnie is now marching with the Cadets. This photo can only begin to show how happy they were to see each other almost a year after saying goodbye after the World Championship Finals.